The Mesquite Regional Landfill (MRL) intermodal facility was completed in 2011 to process Los Angeles County Sanitation District waste-by-rail trains that will transport municipal solid waste to the regional landfill located 4.5 miles east of Glamis. The MRL intermodal facility and rail spur are built to Union Pacific specifications and are permitted for up to five unit trains a day. 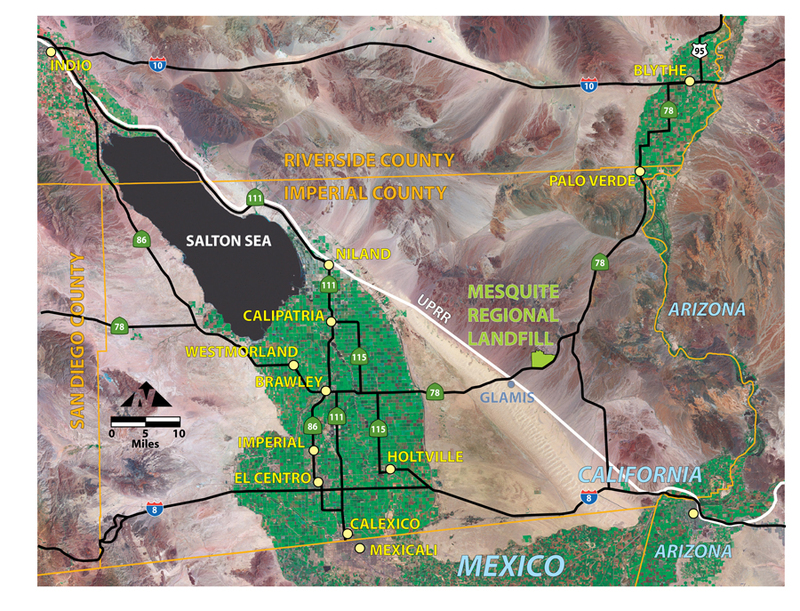 • Approximately 4.5 miles of rail spur connects to the Union Pacific Sunset line northwest of Glamis. • The rail spur, within a 150’ wide Bureau of Land Management right-of-way, features three at-grade crossing with signals andcrossing arms. • Lead track at the MRL property boundary provides for the staging of trains to avoid blocking grade crossings. • Every 1,000’ along the spur, block outs are provided for desert tortoise crossings. • The 100-acre MRL intermodal facility includes a 300’ long double track rail bridge that crosses a storm water channel on the perimeter of the MRL site. • Two 1-mile long strip tracks for loading and unloading trains. • One run around and tail track for repositioning locomotives on trains. • An engine tie-up track and maintenance pit for service of railcars and locomotives with access to electricity and water. • Crane maintenance pad with electricity and water. • Rail container wash station with a water recycling system. • Yard lighting to accommodate nighttime operation. • 6,800’ long berm for visual screening of intermodal yard operations.